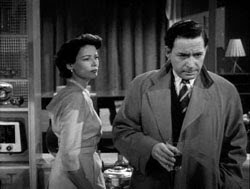 Personal Affair (1953). British drama film. Director: Anthony Pelissier. Cast: Gene Tierney, Leo Genn, and Glynis Johns. The story is about a teen-age girl who has crush on her Latin teacher, Stephen Barlow. When Barlow's wife Kay confronts Barbara, she runs away. Stephen goes looking for her to try to calm her down. Barbara does not return home for three days, during which time Stephen is accused of causing her death without any evidence. Her spinster Aunt Evelyn gossip, makes the situation worse. The first film of Nanette Newman.